Jo Jo Smith was hungry for music right from the start. Born in Dunedin New Zealand in 1953, Music was fed to her in daily doses by loving parents. Jo Jo was singing in dance bands by the time she was 10 years old and playing drums and singing professionally in a band by the time she turned 14. After leaving school she worked in an advertising agency writing / singing and playing drums on Radio and TV commercials. 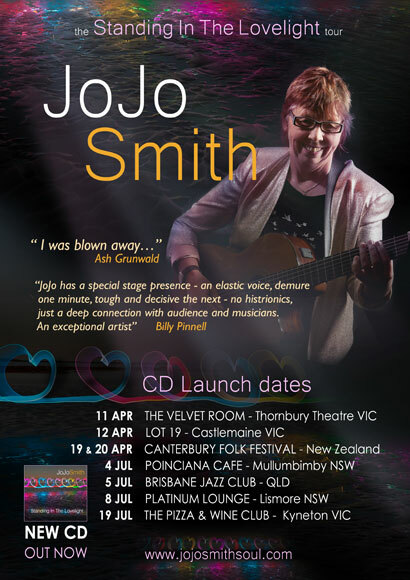 Jo Jo toured extensively in bands around New Zealand She arrived in Australia in 1974. Her latest Album “Standing In The Lovelight” was recorded in September 2013 at “Tone Ranger Studios” in Northern New South Wales. This CD contains 8 original tunes and four covers. Jo Jo plays drums on four tracks on this CD and her musicians are Greg Lyon – bass, Steve Russell –piano, Jim Kelly – guitar, Dave Sanders – drums. Guests are John Hoffman – flugelhorn, Martha Baartz – alto sax, Kirk Lorange – electric slide guitar. Sheryl Black, Vanessa Baker, Rick Fenn and Greg Lyon backing vocals. “Standing In The Lovelight” is a collection of songs that speak about Life and love for Music and the Musicians she loves and admires. They also speak of Inner Fears, Miracles Surrendering to what 'is' and Peace.